Distant cousin and fellow researcher, Sam Patterson, recently shared a discovery of his with Harald (Reksten) and me. It involved some court cases from old Augusta County, Virginia from the 1760's involving our ancestor, Robert Patterson, and other men represented by attorney, Thomas Jefferson - future President of the United States of America, and author of the Declaration of Independence. Sam had located some seven or eight references to our Robert Patterson in the personal notes taken by Jefferson during those years, which have since been published on the Internet. Upon further investigation, I found no less than 23 such references to "our" Robert Patterson during the years 1767-1770. Jefferson's notes centered around court cases primarily dealing with land ownership in several counties, one of which was Augusta County. The county seat is Staunton, VA and during the 1760's that county included the area north of Staunton such as Harrisonburg, where the Linville Creek community is located. This is modern day Rockingham County. The lands described below are about 3 to 4 miles west and NW of Harrisonburg, VA. The previous link is to the notes from 1767, but you will find records for Robert Patterson on three separate cases across the first four years. Some references spell his name "Patterson" and others spell it "Patteson", but it is clear from years of research that there is no doubt as to the authenticity of this identity as being his. The following years match to the corresponding links. As mentioned prior, there were three cases that involved our Robert Patterson. There are other Pattersons named in Jefferson's memorandums, but they are not our Pattersons. Case #1 was a suit brought by Andrew Johnston and Thomas Bowyer (land speculators) in an attempt to obtain lands that had not yet been patented (granted) and/or that perhaps were behind on taxes (quitrents). Johnston and Bowyer retained the services of Thomas Jefferson to represent their interests. John Madison Junr was also involved and it's unclear whether he retained the services of Jefferson with the other two men, or if his services were retained alongside Jefferson. John Madison Junr was the 2nd cousin of James Madison, another future President of the USA, and "Father of the U.S. Constitution". "18 November 1767, Andrew Johnston, and Thom. Bowyer direct me [Thomas Jefferson] on behalf of themselves and John Madison junr. to enquire if a patent has issued to Robert Patterson for 500 acres on Linwell’s creek called the [. . .] tract ( ). If no patent has issued [. . .] a caveat in the name of Andrew Johnston but if patented, enter a petn. for nonpaiment of quitrents and want of cultivation and improvements. Also do the same with another, a tract of 300 acres on the same creek. Mem. they are not certain of having exactly mentioned the number of acres. They have been surveied above 10 years." For three years (spanning the four calendar years) there were a total of 10 references in Jefferson's notes to this case, usually denoted as "Johnston v. Patterson". The notation dated 13 February 1768 clarifies the tract of land in question actually involves 265 acres, which were indeed patented by Patterson on 7 June 1764. Patterson retained this land and it was later disposed of by his sons, Robert Jr and Peter Patterson, in 1787. Case #2 was a "friendly suit" involving Daniel Smith, who entered a suit against Robert Patterson for the purpose of "tying up" land for a period of time to protect it from being taken over by land speculators. Smith also retained the services of Thomas Jefferson. The first entry for this case was four months following the first case. This tract of land, however, centered on the 330 (or 340) acre plantation owned by Robert Patterson's mother, Margaret Adams. She had recently passed away, and was to be inherited by her sons... more on that shortly. "16 March 1768, Daniel Smith (Augusta) v. Robert Patteson (Carolina). Enter petn. for 300 and odd acres on a branch of Linwell’s creek Augusta patd. about 16 years ago by Mary Adams. Recd. 1/6." Robert Patterson's mother has been known by many names over the years. You will find data all over the Internet about her by the name of "Margaret Donnell". I can guarantee you, however, that her name was not Donnell. The woman referred to on the Internet as "Margaret Donnell" is this person here, but her maiden name was not "Donnell". This theory (error) was started by D. O. Hood in his book on The Tunis Hood Family, which is an excellent resource. I explain the error at http://www.wespatterson.com/2010/03/robert-patterson-mother-donnell-i-no.html. Robert's mother, Margaret, first married William Patterson, father of Robert Patterson. She later married John Adams (aka Addams). Both men apparently died young, leaving her widowed twice at a young age. She had children by both marriages. She had one son Robert Patterson, and another son Samuel Adams. When she wrote her will in 1744 under the name Margaret Adams (her name for the last 45+ years of her life), she left her 330 (340?) acres to both sons. By 1748, her son Samuel Adams died, and the Samuel Adams we see in later years was Samuel Adams Junior, grandson of Margaret Adams, and nephew of Robert Patterson. To complicate matters further, Samuel Adams Sr's wife was also named Margaret, and so the administratrix of his estate in 1748 was Margaret Adams his widow, not his mother. Fast forward to 1768, Daniel Smith is entering a friendly suit against Robert Patterson and Patterson's interests in inheriting his mother's land, in order to tie it up in the courts and give Patterson - and his nephew Samuel Adams - time to pay up on the taxes (quitrents) owed, and get clean titles in their names. But here is where things "went south". When Margaret Adams obtained a patent for her 330 acres on Linville Creek on 12 May 1759, she had already been living on it for close to 20 years. She could not read or write, and when the clerk of court wrote her name as "Mary Adams", she made her "X" mark not knowing it was under the wrong name. I used to think her name was Mary Margaret, and that she went by Margaret, but this court case proves that her name was never Mary. It is very clear about that. There were 12 notations of this Smith v. Patterson case involving this land in Jefferson's books. One of the records was the beginning of another case, but Jefferson refused to take up that petition. See following. "Circa 1 March 1770, John Madison junr. v. Mary Adams ( ). Enter petn. for 340 acres Augusta same as already petned. for by Daniel Smith v. Robert Patterson. Enter a petn. and get Sum. for pl. Note as I am emploied for Smith I do not undertake this petn. They must search in the office whether the works and patents agree. Answ. they do." "22 March 1770, Smith v. Patterson. These lands were taken up and possd. by Margaret Adams. The works were by mistake retd. in the name of Mary Adams and the pat. so issd. On the death of Margaret the lands descended to Robert Patterson the def. her son and heir. Jesse Harrison will prove her occupation of them. Smith has given def. his choice to give up lands on paying his expences or to purchase for 30£ so that this is friendly petn. to cure the error in defs. title." Robert Patterson had already decided to not lay out the expenses to settle this title error. The cost was too much, and he had already moved to South Carolina by this time. For years, we had a record of a letter Patterson wrote on 1 February 1770 disclaiming any rights to his mother's land, but we didn't know why. These court cases now explain to us why. Here is that letter. This case (Smith v. Patterson) was dismissed on 23 August 1770. John Madison agreed to pay the court costs and Smith agreed. The twisted irony of the situation lies in the truth that were it not for the error of recording her land under the wrong name, there never would have been a court case that led to Robert Patterson giving up on the land, and therefore writing the letter of disclaimer in 1770 - a letter which named his father, William Patterson, and his step-father, John Adams. This writer knows of no other document that names either man, whatsoever. Case #3 involves the same land - Margaret Adams' land - but the defendant is the other heir, her grandson Samuel Adams (Junr). Daniel Smith (of Augusta Co) retains the services of Thomas Jefferson once again, but Jefferson cuts to the chase on the outcome and this is the only reference in his notes concerning this case. See following. "17 April 1770, Daniel Smith (Aug.) v. Samuel Adams (Augusta). Enter petn. for 340 acres on a branch of Linwell’s cr. Aug. granted by pet. bearg. date May 12. 1759. to Margaret Adams who by mistake is called in the sd. pet. Mary Adams. Note our first petn. was wrong because the lands were devised to Samuel Adams, and so no property in Patterson, & Madison’s petn. is wrong because Mary Adams whom he has made def. has no color of title, the true patentee being dead." Samuel Adams tried to hold onto the land, but failed. He had already moved to North Carolina (actually SC) by 1770, and so he reached out to his first cousin's husband, Joseph Dictum, to be power of attorney for him to sell or convey the land on his behalf. Samuel's aunt, Jane Adams had married Daniel Love. Their daughter Rachel Love then married Joseph Dictum. What the following record means is that Samuel Adams (Junr) in 1770 was the eldest son and heir of the Samuel Adams (Senr) that Margaret Adams willed her land to in 1744. But Samuel (Senr) had died in 1748. "August Co VA, Deed BK 16-315. 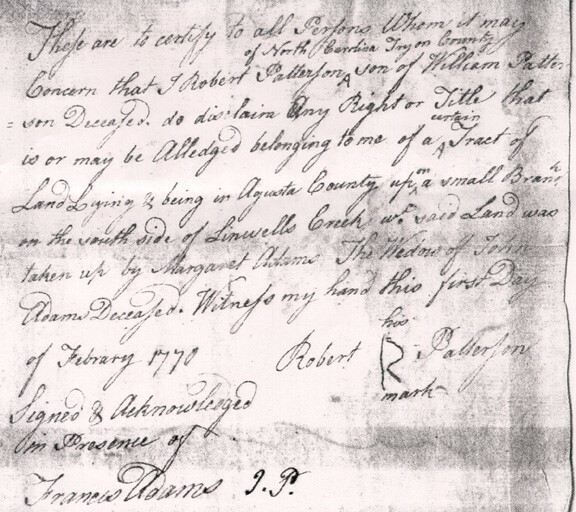 15 May 1770 Samuel Adams of North Carolina to Joseph Dictum, power of attorney to convey 340 acres on Branches of Linvells Creek devised by Margaret Adams and from him descended to Samuel as eldest son and heir, having been patented in the name of Mary Adams. Signed: Samuel Adams. Acknowledged: 15 May 1770 by Samuel Adams. [Note by Chalkley Title yet to be made to Samuel]." The land was ultimately assigned to Michael Bowyer (Bower) in 1772 as shown here. "August Co VA, Deed BK 40-710. 20 June 1772 Michael Bower and John Madison Jr, 340 acres in Augusta County on a branch of Linwells Creek. Whereas by patent 12 May 1759 Granted unto Mary Adams [34-248] And whereas Samuel Adams in whom the Right of the said land is since become vested hath failed to pay such Quitrent and John Madison Jr. hath made humble suit and obtained a Grant for the same part whereof he hath assigned unto Michael Bower; £1 15 Shillings." You really can't make this up. It was a very convoluted mess for a number of years, only to be complicated by the Revolutionary War in the coming years. To further complicate matters, the area of South Carolina where Robert Patterson and Samuel Adams moved in the 1760's, was just south of the North Carolina border. For a number of years, it was actually claimed by NC and therefore you see records referring to them as residing in and owning land in NC and SC and about four different counties within those two states. And yet, they never moved during that time. Finding these court cases has filled in many blanks - many unanswered questions. There are still many more, but I am grateful to Sam Patterson for finding these records and filling in many of the gaps in our research. Likewise, I am grateful to Harald Reksten for transcribing countless thousands of records from dozens of counties in numerous states over the last 20-30 years. What a treasure we hold in our hands now.